The Japanese satellite GOSAT (Greenhouse gasses Observing SATellite, or IBUKI in Japanese) has been studying greenhouse gases from space since January 2009. In May 2015, many reported that carbon dioxide levels were recorded at 400 parts per million for the first time—a concentration that scientists have marked as a milestone towards irreversible climate changes on Earth. While still damning, the measurement was made at a single point at Mauna Loa Observatory in Hawaii. GOSAT, meanwhile, has been taking whole-atmosphere monthly mean measurements, shown in the graph at right. 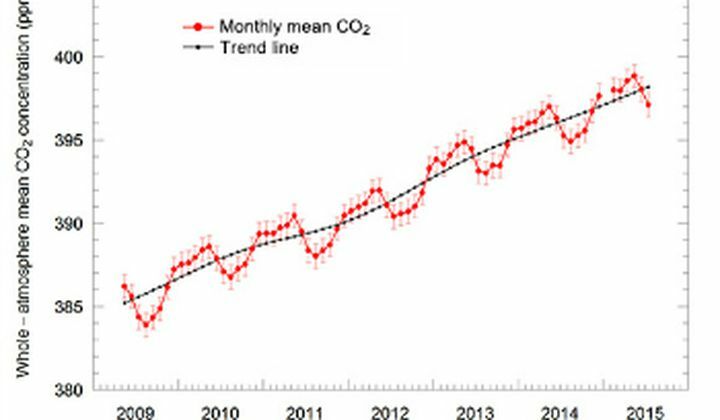 JAXA released the measurements for the first half of 2015, showing how the CO2 concentrations slowly rise and fall, but are on an overall upward trend. Extrapolating that trend shows that the CO2 concentration, averaged over all layers of the atmosphere, will reach and exceed 400ppm in 2016.